Designed by Charlotte Perriand for her flat in Paris, the Siège Pivotant, also known as the LC7, is a small armchair first exhibited at the 1928 Salon des Artistes Décorateurs and then integrated within the LC Collection in 1929. What is the Siège Pivotant? The Siège Pivotant is a small armchair designed by Charlotte Perriand in 1927 for her flat sited in place Saint-Sulpice, Paris. It was first exhibited at the 1928 Salon des Artistes Décorateurs in the Salle à Manger 28, and subsequently at the 1929 Salon d’Automne, when it was integrated within the LC Collection, the collection co-signed by Le Corbusier, Pierre Jeanneret and Charlotte Perriand. The Siège Pivotant, produced and distributed by Cassina. When was the Siège Pivotant conceived? Only two years after graduating, Perriand renovated her apartment into a room made of aluminium, glass and chrome. She then recreated the design of the “Bar sous le toit” (the bar under the roof) at the 1927 Salon d’Automne. It was shining with gleaming aluminium and nickel-plated surfaces, leather cushions and glass shelves. At the time the press highly praised Perriand and addressed her design as a great success. The Siège Pivotant by Charlotte Perriand, 1927. But the designer was not satisfied, she aimed at working for Le Corbusier and pursue serial production and low-cost housing, but when she applied to work at Le Corbusier’s studio in 1927, she was famously rejected with the reply “we don’t embroider cushions here”. Yet a month later, Le Corbusier visited her show at the Salon d’Automne, where the Siège Pivotant and the Bar sous le toit were still exposed, and he became convinced to offer Perriand a job in furniture design, adding the Siège Pivotant to his collection. 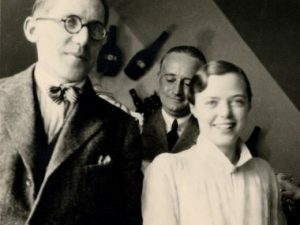 Le Corbusier, Charlotte Perriand and her first husband at the Salon d’Automne, Paris. The revolving small armchair is characterised by a polished trivalent chrome plated enamel steel frame, that can also appear in semigloss grey, light blue, green, brown, mud, ivory and black. Its back and seat cushion are padded with CFC-free polyurethane foam and polyester wadding and ermined with leather or fabric. It is currently available in two versions: with 4 or 5 legs, and several different finishes, both for the structure and frame as well as the upholstery. In fact, the chair is also available in an outdoor version designed specifically to be water-proof and weather resistant. The Siège Pivotant, details of the frame and cushions. The outdoor version of the Siège Pivotant is made entirely from polished AISI 304 stainless steel. The internal structure and back of the seat are made out of pre-treated steel in an electroplating bath and finished in black. Details such as the silver welding and the use of black PVC foot ends, ensure maximum durability and reliability in all weather conditions. The cushion insert in water draining polyurethane, has been developed is designed to make water flow through, preventing stagnation and the accumulation of liquids, mould and unpleasant odours. The back inserts are in CFC-free polyurethane foam with water-repellent coating and the fabric uses a high tenacity polyester yarn, PVC coated. It is available in 5 colours. Top view of the outdoor version of the Siège Pivotant. — semigloss grey, light blue, green, brown, mud, ivory or black enamel steel frame. • Leather or fabric upholstery. • The fabric uses a high tenacity polyester yarn, PVC coated.